As far as the hands go, neither Varun Gandhi nor Rahul Gandhi show the leadership ability that the Gandhi family is famous for. However Varun has some qualities that could make him a better politician than his cousin Rahul. Not many details can be seen from web photos but one can get a sense of what Varun is like. the developed mounts overall, slim fingers, a long Mercury finger and a medium set thumb. (For an image of Varun's hand click here, and for Rahul Gandhi's hands click here.) 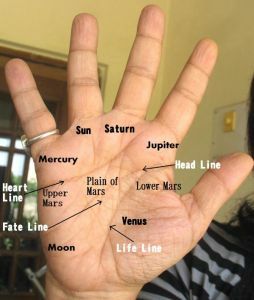 And the link to a more detailed reading of Rahul's hand is given below this post. Varun Gandhi’s reputation for being excitable and aggressive is borne out by the developed mounts, particularly that of Mars, and unfortunately his thumb is not strong enough to keep his emotions under control. The thumb additionally shows that he can be quite blunt. His ability to see other points of view is also limited (Headline) and this ability has decreased from what he inherited (passive hand vs active hand). His ability to lead others is also limited, and here he is similar to his cousin Rahul. Idealism has increased (Jupiter) and this shows that Varun would be uncompromising where it concerns his beliefs. He tends to be high-minded and righteous and would tend to stick to his views whether practical or not. Here he differs distinctly from Rahul Gandhi whose idealism is limited and more of the practical kind. There is no doubt that whether it is country or religion, Varun Gandhi would be far more patriotic than Rahul. But idealism can be taken to an extreme and it can make people unpredictable. Not a reassuring quality for anyone with political power. Varun wants power (Jupiter), but whether he has the maturity to handle it is another matter. Varun's Mercury finger reveals that he is clever and shrewd and can be diplomatic if he wants to be. He is intuitive and eloquent, and his powers of expression could easily translate into oratory. He has some amount of charisma. Varun Gandhi is less of a humanitarian than Rahul Gandhi, but he has sympathy for the underdog, and most important, more of an unselfish approach (hand shape). There is no doubt that Varun would put his beliefs before himself. Rahul Gandhi is more selfish, and would be more concerned about how his actions impact himself and his family. Some of Varun Gandhi’s inherited qualities have changed (from the left passive hand to the right). His analytical and professional ability has reduced considerably from what it was (Apollo and Saturn). The trappings of status symbols and success are more of a concern to him now. What has also increased significantly is moodiness and melancholy. That these qualities were developed in childhood means that the death of his father and the consequent rejection by his father’s family must have affected him deeply. Varun Gandhi’s hands show more long-term success (fifties and sixties) than Rahul Gandhi’s. In fact Rahul’s hands show that as he approaches the sixties he withdraws into himself. One is not sure about Varun’s career path. His idealism could well be turned away from politics into something else (if he doesn't get the stage he wants). I wonder if that means that he takes over his mother’s work as an animal rights activist? Related Reading: What do Rahul Gandhi's hands tell us about his capability as a politician? Or Rajiv Gandhi's hands show that he was shy or find out what Sonia Gandhi's hands say about her and also that of her daughter Priyanka Gandhi. Its going to be difficult for Varun to get to any kind of powerful position. But the analysis of Rahul poses more questions - He is the son of two successful leaders and still how can he not inherit their qualities? Can we expect a turning point in his life, like what happened with Indira? I agree with you about Varun. He seems to be struggling in politics. About Rahul, he is the son, grandson and great-grandson of three powerful leaders with great charisma. However, he appears to have inherited his characteristics from his mother's side of the family. It's all the luck of the draw isn't it. Also I doubt that Rahul was honed to be a political heir from childhood as Rajiv Gandhi was satisfied being a pilot and his mother Sonia did not want politics in her life at that time. So Rahul did not grow up in an environment where he could have been groomed as a leader, not until he was much older. Indira had Nehru and other great leaders. As far as Rahul is concerned, he holds the key to the vast fortune of the gandhi family and so he will be made the leader, like his mother was. But it is not just getting the chair that matters, but the performance. stereotypically politics is not for good people. wonder if their respective sun signs,pisces and gemini has something to do with idealism.gemini rahul can never be emotional enough to side up with the underdog. Yeah I know what you mean, that is the way politics is in India. In many western democratic countries though politicians are good people and highly intelligent too. About Rahul, I think he is more inward looking and becomes more so as he grows older. do you mean selfish for rahul above? Not really. I meant his approach to issues, the way he views things, from his own perspective, not the point of view of say the country. In any case this was mentioned only in the context of Varun Gandhi, and as a comparison to Varun. Rahul Gandhi's approach may be unselfish if compared to someone else.